Popular as The Rock N Roll Barbie, Melissa Marie is the lead vocalist and DJ of Millionaires which was accidentally started by her and her sister Allison Marie Green. Apart from being a singer, she is a tattoo artist as well. Her love for tattoos has inspired her to get herself tatted with these body inks. Check out below to know about her body arts and their relevance to her. The right wrist of the pop singer is inked with a diamond of blue color. As diamonds are unbreakable thus they represent strength and invincibility. 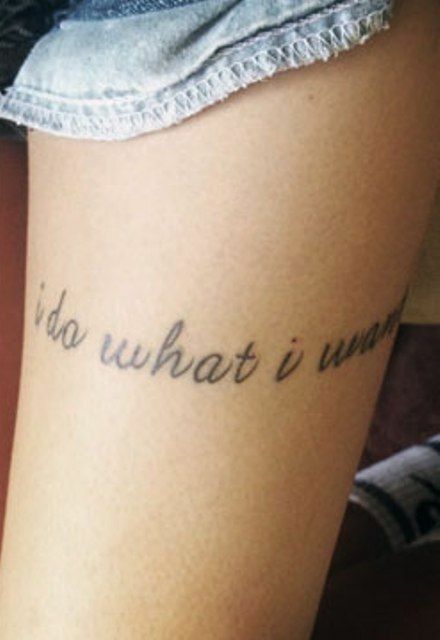 She got her left thigh inscribed with a writing “I do what I want” which are the lyrics from the song “Party like a Millionaire.” This piece of writing describes what does life mean to her and how it should be lived. 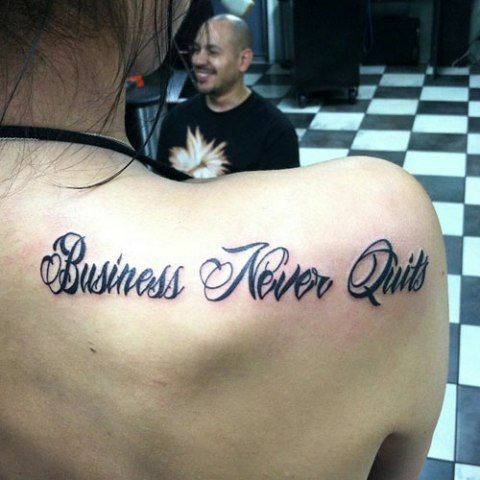 Melissa has the back of her right shoulder inked with “Business Never Quits.” Her sister Allison even got this slogan tattooed on her foot. 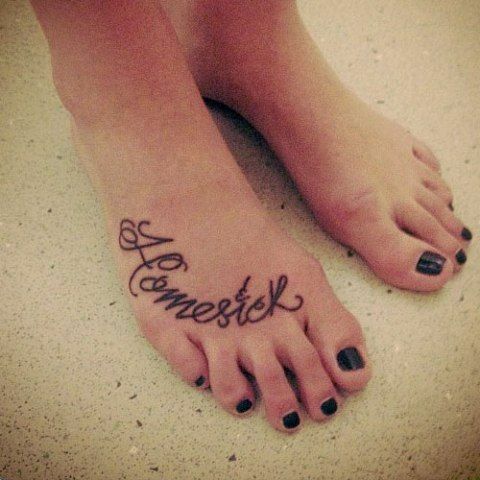 The upper side of her right foot is inked with the word “Homesick” in a regular cursive writing when her Millionaire band was on tour. 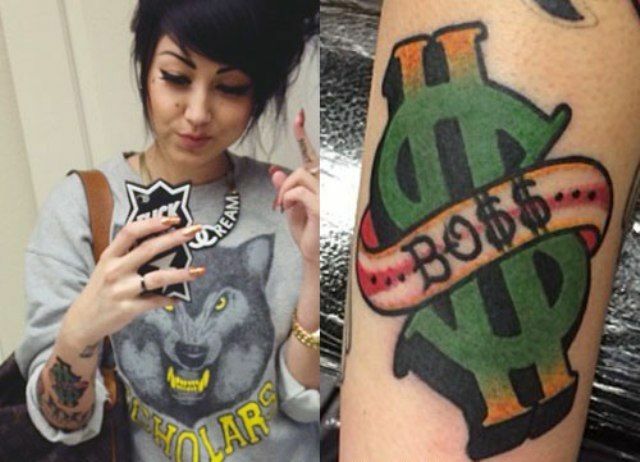 She got her first tattoo on the inner side of lips with “I ♥ $” which means she loves money. She got her knuckles inked with the initials of Louis Vitton, LV which is a symbol of a luxury brand. And also, there is a heart and a letter A tattooed on her finger. Whats interesting about this tattoo is that her tattoo is written with ultraviolet ink and is visible only in UV light. 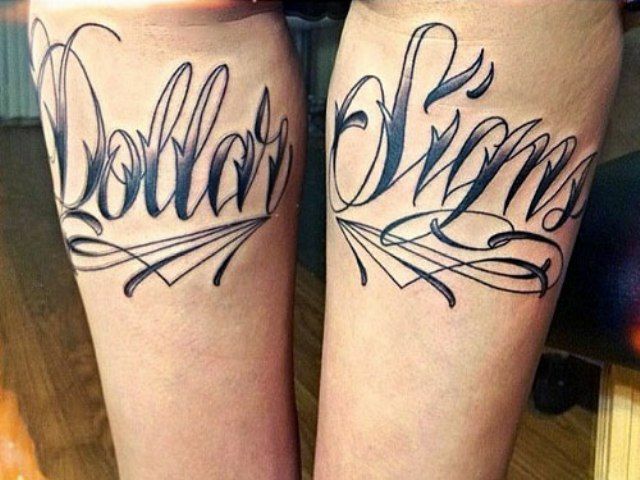 There exists a writing with “Dollar Signs” on the back of her thighs in cursive letters with quite a large font style. She got a pair of pretty flamingos on her forearms. The cute flamingos are filled with peach color. Melissa Marie green has got a red colored little heart on the inner side of her left hand’s ring finger. 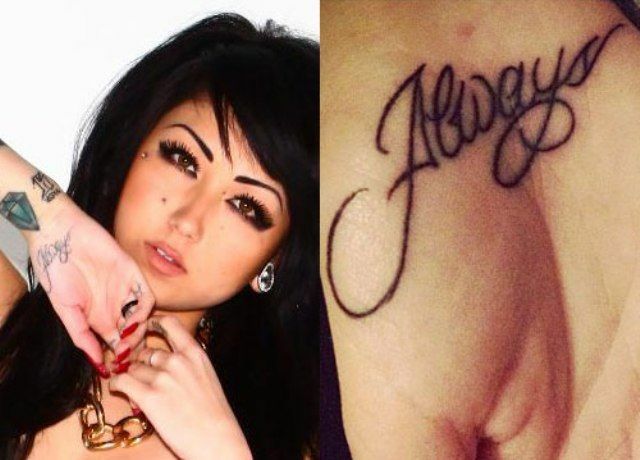 Her then boyfriend Oscar Wylde has even got this matching tattoo on the inner side of his ring finger. Melissa got her a beautiful red colored flower with green leaves tattooed on the left side of her flamingo tattoo. 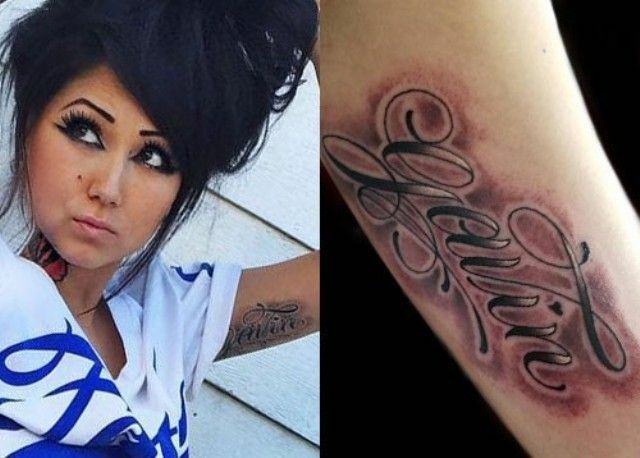 She got this tattoo to fill up the empty space left on her right forearm. 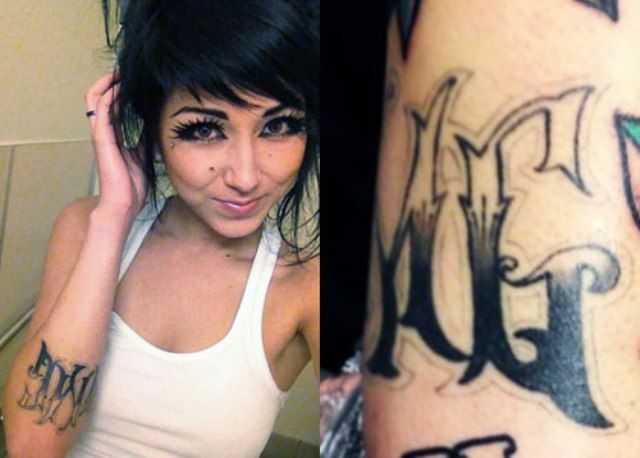 The outer side of Melissa’s right elbow is tattooed with the initial’s of her sister’s name Allison Maria Green. Well, what a sisterly act it is! A beautifully colored glass of Martini with a banner stating “Like Mother Like Daughter” is tattooed on the inside of her upper right arm. Both, the mother and daughter enjoy sipping martini together as she is very close to her mother and loves spending time with her. 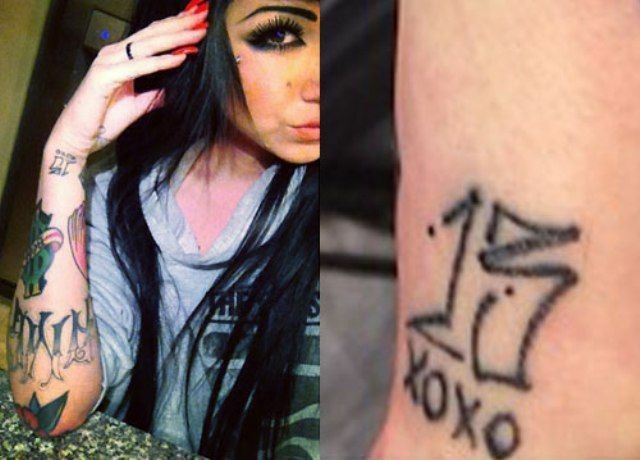 Melissa Marie Green got the hugs and kisses symbol “XOXO” and number “13” tattooed on her right wrist. She got the pair of heart-shaped candies tattooed on her elbow of blue and pink color. 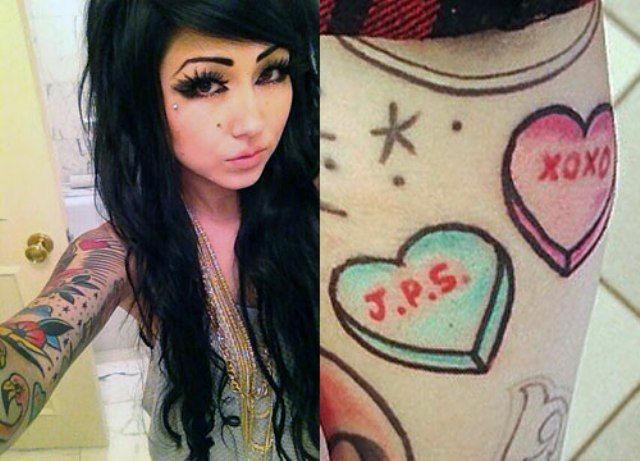 The blue one has the initials “J.P.S.” for her then-boyfriend Joshua P Schlienz and the pink one with “XOXO” which is a symbol for hugs and kisses. A queen from the deck of cards is being tattooed by Melissa on her right sleeve. Below the queen’s tattoo, a red colored rose is also inked on her sleeve. Melissa’s right side of the neck is tattooed with a red and pink colored rose with green colored leaves. She has 2 dice tattoos inked on her right sleeve placed between her flamingo tattoo and dollar sign tattoo. She has an immense love for the gambling city and therefore this might be one of the reasons why she got it inked on her body. 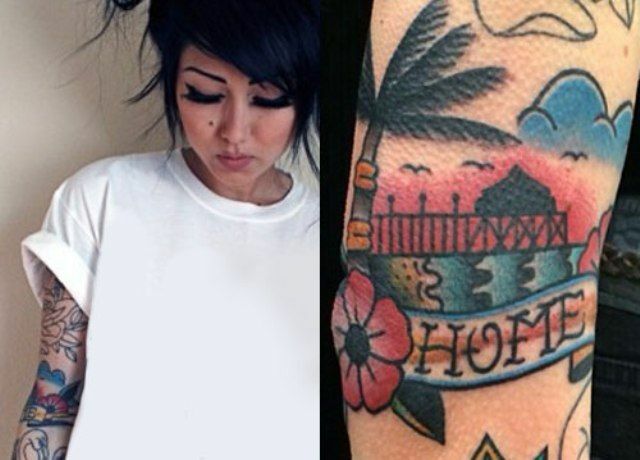 Melissa has this matching tattoo as that of her sister Allison Green on her foot. Her foot is inscribed with “$U$” which is used as a slang for “Suspect.” A suspect is a word that is often used to describe something doubtful. She got the inner side of her left hand tattooed with the name of her husband “Gavin.” Though the marriage of couple didn’t turned up well because of the domestic violence that she faced. Melissa got two Latin words “Prima Donna” inked on her stomach. “Prima Donna” translates to First Lady performing in opera. She considers herself to be better than others while singing and therefore she has been criticised for her this act. 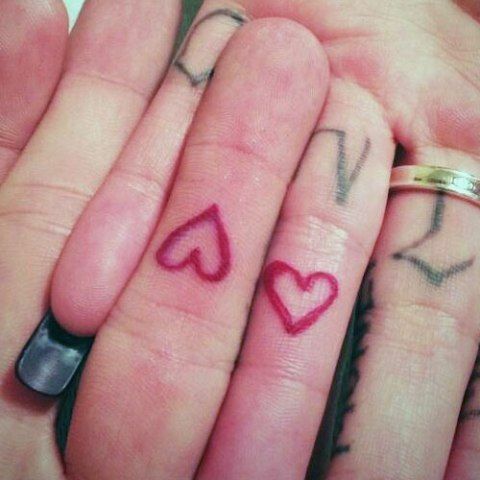 A red colored heart is wrapped in a banner with a word “Daddy” inked on the back of her right hand. 2 yellow flowers with black leaves are tattooed near the edges of the heart.